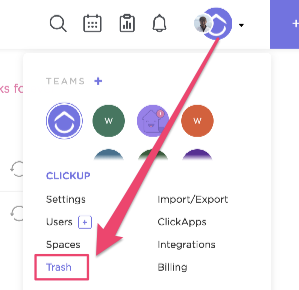 It's always worth being careful before deleting anything in ClickUp, however, deleted tasks are stored in a 30 day waiting room found in your team settings page. Tasks shown here will be automatically deleted forever after 30 days - so don't let them sit around! Be careful with this option. We will not be able to restore tasks after this has been selected. Bring the task back into your active Lists! Note that tasks are sorted in the Trash Can by the date that they were deleted.